Posted by Dirk under: television . Bryan Cranston played the dad in Malcom in the Middle. He plays the dad in this tv show also, but he’s not nearly as wacky. He’s Walter White, a high school chemistry teacher who finds out he has lung cancer, hooks up with an old student of his and starts making and selling meth. 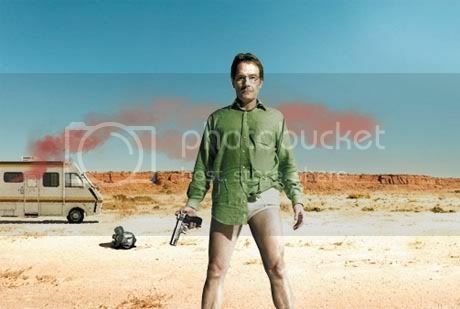 By the end of the first episode he is in the middle of the desert in his underwear, like in the picture here. I really like this show. Cranston is a heck of an actor. The other people on this show all do a good job too. It’s being called a dark comedy and I agree with that. It’s on AMC and if you can, you should check it out. It’s one of those you really should watch from the start though, so maybe you’ll be better off waiting for the dvd set. 7 March 2008 at 11:27 am. Thanks for the blurb on this show. I had wanted to watch this series after seeing a few previews for it and reading a few reviews. However, after watching five minutes of the first episode I gave up. My attention must have been elsewhere. I’ll give it another shot.